MapDance has been a chance to take time to evaluate what it is to be a performer. The programme provides an environment that lets you focus on your own dance development. The extensive physical training during the course is led by tutors who are thoughtful and supportive whilst still challenging you. As students, you get a chance to work with a really varied group of choreographers allowing difference sides of your performativity to develop. This year I have worked with Lea Anderson, Shobana Jeyasingh, Cai Tomos and Hagit Yakira. During my time at Chichester University I have grown as an individual whilst nurturing my artistic practice, preparing me for the first stages of my career. Working intensively with international guest choreographers, students develop their technical and performance skills and deepen understanding of the creative process through experiencing varied choreographic methodologies and artistic approaches. mapdance operates as a professional company with daily technique classes and rehearsals. From mid-February to May, the company tours nationally and internationally whilst also offering educational workshops. The 2017/18 Repertory includes new commissions and from Niv Sheinfeld and Oren Laor, Laila Diallo, Helen Parlor and Laura Aris. The Techniques for Performance module accompanying the repertory module (and compulsory for performers route) focuses on excellence in contemporary dance performance involving daily technical training in various dance techniques including release and contemporary techniques, contact improvisation, pilates and Ballet work. This module normally runs autumn and spring semesters. The MA Performance Dance operates in the context of a professional performance programme and a series of presentations by visiting artists and researchers. Guest lecturers on the MA have included practitioners and curators all working at the edges of dance research. There are also opportunities to engage in cutting-edge research with interactive technologies or to market yourself professionally as an artist using DVD and website technologies. 26 February, 27 March and 10 May. Dance students have the use of four dance studios, a fully equipped 250-seat theatre and a 110-seat studio theatre. "On graduating from mapdance I moved back to the North East and began working at Dance City teaching community classes and working on the Ticket Office. Over the years I've also taught and choreographed for YDT, Dance City CAT, Big Dance and on many other projects. I have also performed for Neville Campbell, Dansformation and in the Millionth Runner Ceremony to name a few. Over the past 6 years I have also been developing my work as a producer delivering a scratch platform called FRESH North East. A highlight was also being part of a cohort of North East artist to travel to the Eastern Cape in South Africa to collaborate with local artists to create and perform. Currently I teach classical ballet, contemporary and creative for the Dance City CAT as well as run the CAT Health and Wellbeing programme. I also co-direct a dance producing company called Moving Art Management delivering different cultural projects." This course is suitable for you if you are a recent graduate or a dance artist who wishes to extend their technical and performance skills (and have completed a recognised BA degree). There are opportunities to engage with cutting edge research into interactive technologies and to market yourself professionally as an artist using DVD and website technologies. Now in its 12th year mapdance is directed by co-artistic directors Yael Flexer and Detta Howe. The MA in performance includes three core modules: Repertory, Techniques for Performance and Dissertation plus one optional module. The postgraduate diploma includes two core modules: Repertory and Techniques for Performance and an optional module. The repertory module: mapdance encompasses intensive creation periods with international guest choreographer. Students develop their technical and performance skills and deepen understanding of the creative process through experiencing varied choreographic methodologies and artistic approaches. Operating as a professional company with daily technique classes and rehearsals, the creation periods begin in Sept through to February. From mid-February to May, the company tours nationally and internationally whilst also offering educational workshops. In addition to the three core modules, students are required to select one optional module from the list below. NB not all options will run in any one year, the availability of optional modules will be communicated in the induction week in liasion with students. Normally, a maximum of two optional modules will run in each semester. Assessment on the MA performers route is based on three core modules, Repertory (60 credits), Techniques for Performance (30 credits) and Dissertation (60 credits) plus one optional module (30 credits). 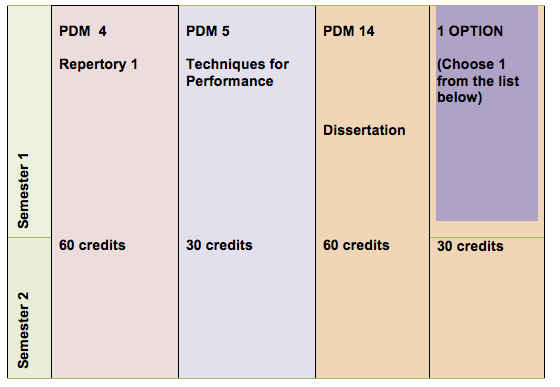 Assessment on the postgraduate diploma performers route is based on two core modules, Repertory (60 credits), Techniques for Performance (30 credits) and one optional module. Assessment Techniques for Performance is continuous, that is process based. Similarly the Repertory module is continuously assessed however the assessment is comprised by marks given by guest choreographers during the creation process and marks given by both Artistic Directors in rehearsal and on tour assessing both process and performance. Application to the course is made by completing the online application form and completing the additional requirements. You will also be invited to attend an audition and an interview. We cannot provide intensive academic support for the completion of these additional requirements but will be able to offer applicants some guidance prior to completing these tasks.